I once again ate sushi for lunch, this time from a take out sushi place near Asakadai station (the station I travel from everyday) en-route to class. There were rolls available in all shapes and sizes. I randomly pointed to two of them and the lady asked me (through gestures) if I wanted them to be chopped up into smaller pieces. It was interesting to see how they’re sold both ways depending on how you prefer to eat sushi-as a role or as bite sized pieces. On the train, I noticed there were curtains which you could pull down on a sunny day, which I thought was pretty cool. I’ve seen curtains on inter-city or inter-state trains before, but never on local trains. Later in class, we watched two episodes of Train Man, a TV show about an otaku who defends a beautiful girl from a drunk man on the train and eventually starts dating her. In trying to ask her out, he takes advice from an online forum of all kinds of people. He is shown to live a sad life with a mediocre job and a boss who hates him. I guess I never thought about this in the past, but watching the show made me realize that geeks are often not successful in life in the conventional sense. Their obsession with gaming and manga comics doesn’t help them with good grades and corporate jobs. In my head, there was a thin line between geeks with nerds (and nerds are usually quite successful). But in reality, they are quite different. In any case, the show was amazing and so addictive. I can’t wait to watch more episodes of it! After class ended, we had a farewell party which included the Waseda staff who’d been helping us and our host families (and ofcourse the students and professor). We all got certificates for completion of the course (it’s the most hilarious and creative certificate I’ve ever received. See picture below). Each of us shared our favourite moment with our host families in the past five weeks. One of my classmates made a video of our past 5 weeks and it was really astounding to remember all that we’ve done. I don’t feel like it’s been 5 weeks, feels more like 2 weeks. Kaori-san, me and Masaki-san at the farewell dinner. 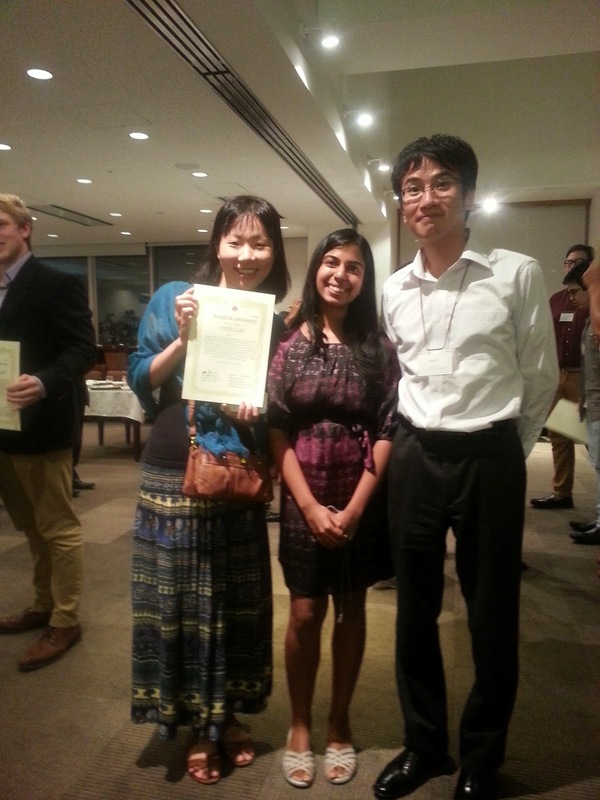 Kaori-san, as a proud mother, wanted to pose with my certificate! Our professor came up with the most innovative description to write on our certificates. 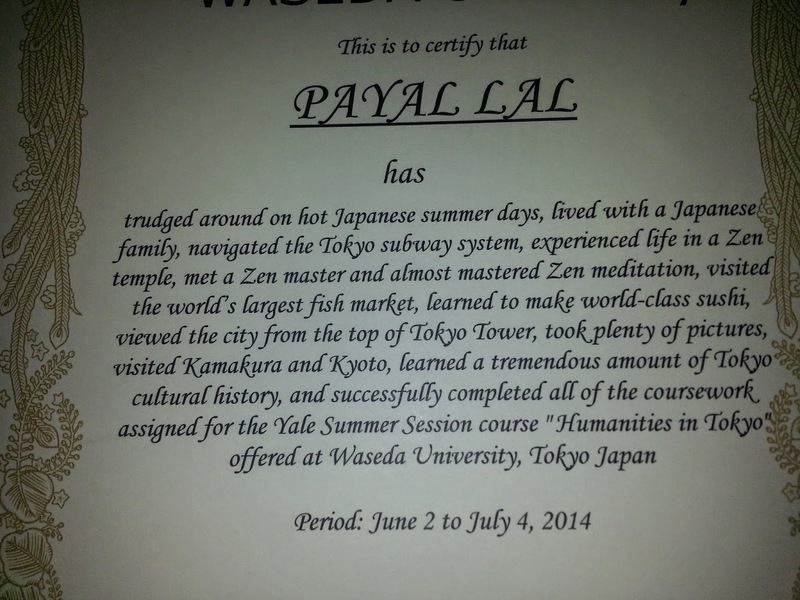 Instead of writing the convention ‘has successfully completed the course’ he wrote a list of all the things we had done as a part of this 5 week course-from trudging around in the Japanese heat to mastering zen meditation! 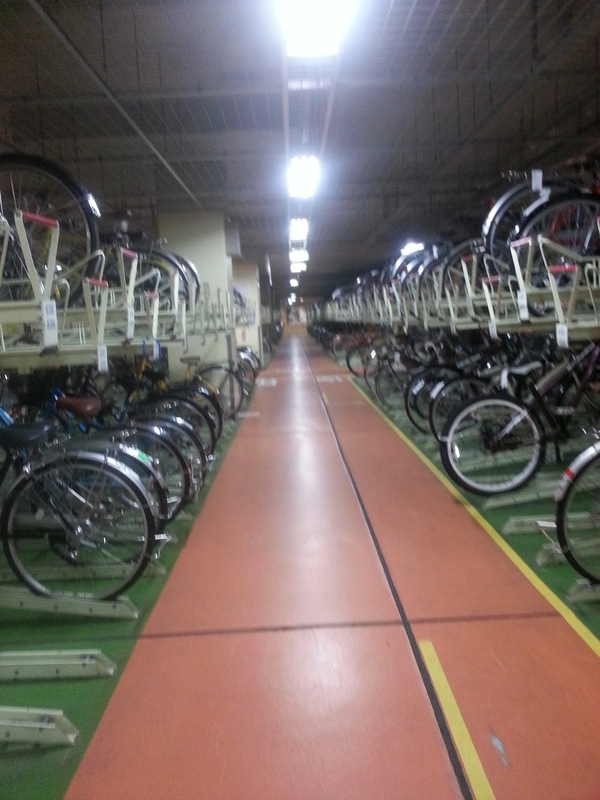 On our way back, Kaori-san showed me the bicycle shed which is by every train station for people to park their bikes. It was very impressive. 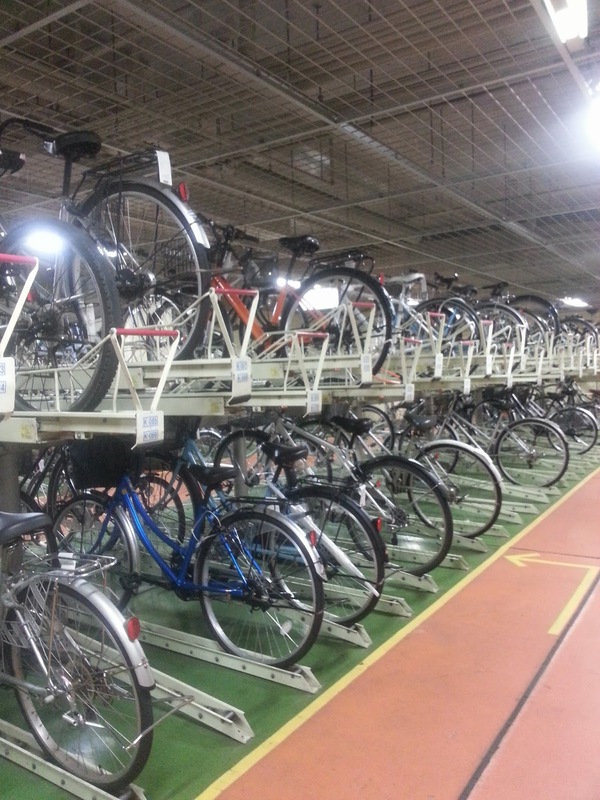 The bicycle shed under the local train station. At 9 pm., it was still quite full. There were several other rows like the one in the picture. The shed was so big that I couldn’t capture it in one shot. Two storey parking: This is actually quite common in Japan, to have bicycles parked on top of each other. 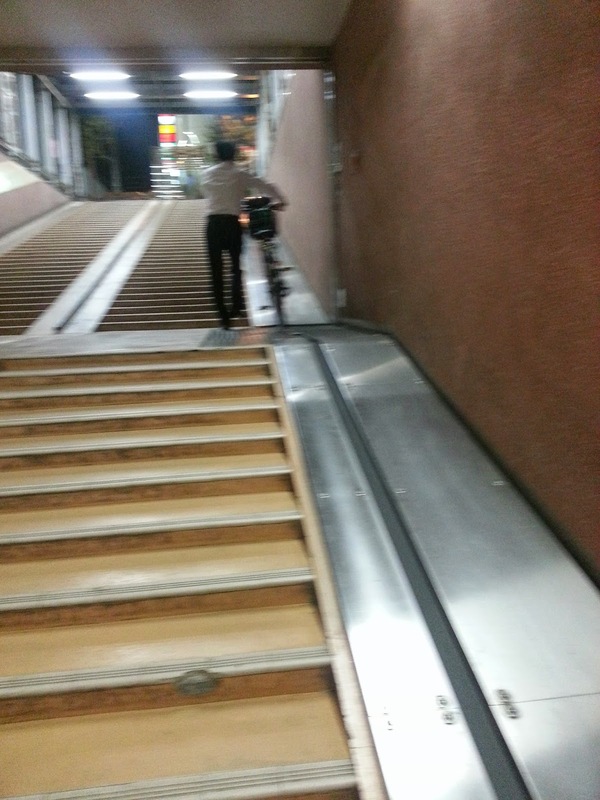 A bicycle walkway: the little black line you see in between the silver panels on the right is actually a moving walkway on which you can put your bicycle. You still have to hold the bicycle, but it reduces the effort you need to put to take it up.